Pigeon and large bird spike has been around for a long time, some people use to call it porcupine wire since the ends of the spike was sharpened to a point thinking pigeons couldn't walk on it. Today most bird spike has a dull end and the bird spike works on the principal that the length of the spike will keep the pigeons off of the spike if they can't touch the base and the spike is hitting them in the body. One draw back to using bird spike is that smaller birds like sparrows and cactus wrens can and will build their nests in the spike, so remember bird spike will not deter smaller birds. Bird spike comes in a number of different styles to fit all sorts of ledges and build outs of building and other structures. Stainless steel spikes are the best for long lasting use, they are not sharp, but are long enough that pigeons and other larger birds can't stand on them. Plastic bird spike came out as a cheaper alternative to stainless steel spike but this product doesn't hold up in Arizona or Nevada temperatures and gets brittle and breaks. 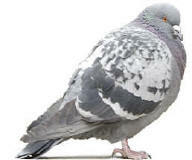 The spikes themselves are also wider and that allows pigeons to hold onto the spike and start to build a nest in them. Gutter spike can be installed inside the gutters to keep pigeons and birds from sitting on the edges and pooping over the sides orif done right can prevent some types of birds from nesting inside the gutters temselfs. Bird spike is a very good product if used the correct way, used wrong and the birds will be able to nest on top of the spike. Bird spike must hang over the edges of the ledges that it will be installed on so that when the bird is flying up to the ledge they bump into the spike. You can leave no more than about 1/2" gap behind the spike and wall or the birds may be able to get in back of the spike and start to build a nest. Wide ledges or parapet walls need to have several rows of bird spike installed on them to keep the birds of of the entire ledge.